There’s only so many ways to squeeze hot plastic out of a nozzle, and eventually witnessing the explosion of 3D printer designs over the past few years gets just a little repetitive. What then, is someone who dreams of a technological utopia, Star Trek replicators, and making a few bucks off a Kickstarter to do? The answer, of course, is a combo machine. Where the Repraps, Makerbots, and the very high-end Stereolithography machines can only do additive manufacturing by laying down plastic or resin layer by layer, these combo machines can also remove material, be it plastic, wood, or metals such as brass or aluminum. At Hackaday, we’re familiar with projects that say they’re exploring space. Most of the time, these are high altitude balloons that ascend up to 100,000 feet. Sure, this is very, very high, but it’s only about 1/3rd of the way to lower limit of what can be called space at 100 km or 62 miles. Now, we’re seeing the first steps towards embedding Arduinos, cameras, and other goodies into the celestial spheres with the NE-1 Rocket, a project by [Jonathan McCabe] in Madison, Wisconsin. The goal of the NE-1 rocket is to launch a 5kg payload into a suborbital trajectory to a height of 120 kilometers. From there, the payload – be it an electronic, biological, or simple imaging experiment – will experience a few minutes of weightlessness before falling back to Earth under a parachute. Getting into space without the help of a government space agency has been done a few times before, mostly with solid-fuel rockets. [Jonathan]’s system uses a liquid-fueled engine, fed with nitrous oxide as the oxidizer and a secret self-pressurizing liquid fuel. These are fed into an engine that uses a ‘cold wall vortex’ to cool the engine instead circulating fuel around the combustion chamber as in traditional engines. What if your Kindle displayed useful information as the “screensaver”? Now it can thanks to this extension of the Kindle weather display hack we covered a year ago. [Pablo Jiménez Mateo] figured out how to display time, date, weather, and tasks as his Kindle wallpaper while retaining the original functionality of the device as an ePaper reader. The hack isn’t strictly standalone. Like the Kindle weather station hack on which it is based, you need a computer to act as the server. We see this as a good thing. The server generates a vector graphic which is used as the Kindle screensaver. This process of scraping and packaging the data is just too much for the computing power of the Kindle alone. Now that [Pablo] got this working without disrupting the normal function of the device, you can remix the hack with your own information sources by working with the server-side code. For those that aren’t familiar with the Linux commands needed to get the Kindle ready, don’t worry. This is reasonably non-invasive. You do need to Jailbreak your device. But once you do, the steps used simply load a small script to grab the images. Released in 1984, the original Macintosh was a wonder – not only did it have a GUI and a mouse, it was actually one of the smaller computers of the day. Now that we’re nearly 30 years past the release of the OG Mac, it follows that a smaller version should be possible. 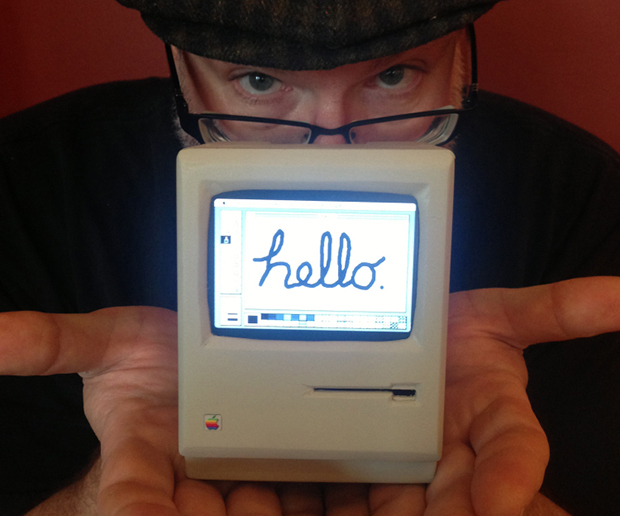 [John] did just that by creating a 1:3 scale replica of the original 128k Mac. As you would expect, this tiny Mac is powered by a Raspberry Pi running Mini vMac, an emulator for these olde tymie 68k Macs. The display is a 3.5″ LCD with a resolution of 300×200, not quite up to the standard classic mac resolution of 512×342. At least this version has color, though. Also inside the carefully crafted PVC case are a WiFi and Bluetooth dongle, along with an off-the-shelf phone charger. It’s a remarkable piece of craftsmanship, and given the games and applications (i.e. Photoshop 1.0) available for these old Macs, its possibly more useful for general computing than a stock Raspberry Pi. You can check out the video walkthrough of everything this tiny little Mac can do below.